Boeing has just committed to the long-awaited launch of the passenger version of the stretched 747-8 after securing a major order from German flag-carrier Lufthansa. Lufthansa today ordered 20 747-8 Intercontinental jetliners plus 20 options. The Lufthansa order, with a total average list-price value of $5.5 billion, is scheduled for delivery beginning in 2010. The order gives the go-ahead for the programme. “Lufthansa operates one of the youngest and most environmentally friendly fleets in the world,” said Scott Carson, president and chief executive officer, Boeing Commercial Airplanes. "The 747-8 will use state-of-the-art technology innovations from the 787 Dreamliner to significantly increase the capabilities of Lufthansa’s fleet. This airplane improves upon the economics of the 747-400, while greatly enhancing fuel efficiency, reducing emissions and noise. We are thrilled that this world-class airline has chosen this world-class airplane. Although 47 747-8 aircraft have been ordered to date, including three VIP versions for Boeing Business Jets, the remainder have all been for freighters. The Lufthansa therefore marks the first serious penetration into a market that was hitherto dominated by the troubled Airbus A380. Lufthansa ordered 15 A380s plus six options in December 2001, and was originally expected to see the first of its initial four aircraft delivered in September 2007 with the bulk arriving over 2008 and 2009. However, given the delays to the A380 announced by Airbus, it now seems possible that the first 747-8Is could arrive within a few months of the initial service entry of the A380. The 747-8F is due to enter service in September 2009 with launch customer Cargolux, while Boeing is expected to announce that the 747-8I is aimed at service entry with Lufthansa in mid-2010. 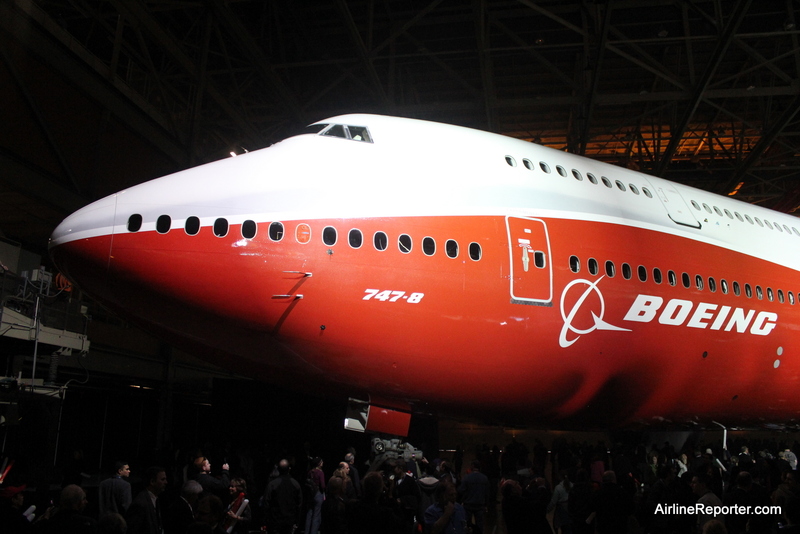 Until now Boeing has been disappointed by the sluggish market response to the 747-8I compared to the -8F which, by contrast, has attracted more early business than it expected with 44 firm sales to-date. The breakthrough appears to be related to Boeing's recent decision to adopt the same 5.6m (18.4ft) stretch of the freighter as the baseline for the passenger version. 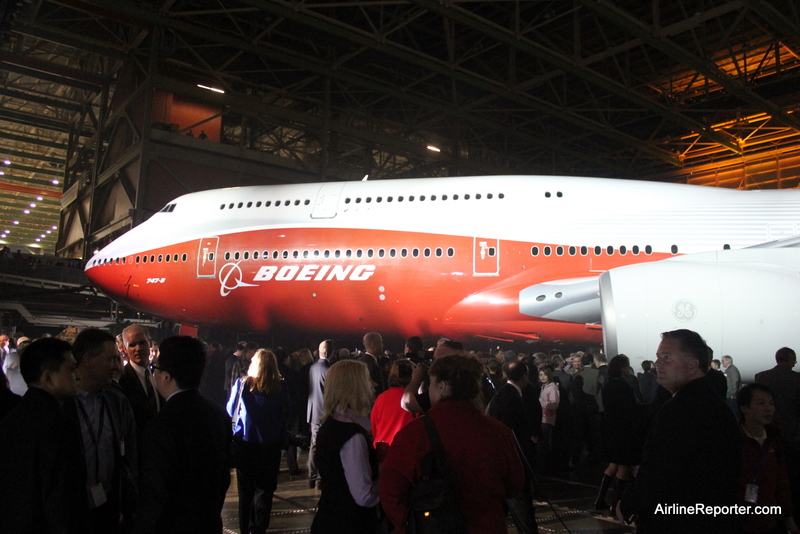 The company says, meanwhile, that it is leaving the door open to building the longer-range, short-stretch version of the 747-8 Intercontinental to meet the requirements of influential carriers such as Emirates. Standardising both 747-8 offerings around the freighter increases the 747-8I's typical three-class seating by 17 seats to 467 over the original version offered, but results in a 500km (270nm) range penalty. The original 747-8I had a 2m forward fuselage plug, but the new version's plug is increased to 4.1m. The overhead galley option, which Lufthansa is believed to have shown great interest in, increases three-class seating by 12 seats to 479. Boeing has completed the first of three rounds of gauntlet testing on the 747-8 Freighter (RC501), marking a significant step towards the aircraft's first flight. RC501's two-day factory gauntlet took place on 4-5 November and consisted of ground control and autopilot checks, as well as testing of the flight deck and power systems. Gauntlet testing places the aircraft in a closed loop simulation that "fools" the aircraft systems into thinking they are flying. The factory gauntlet also represents the first major test of all of the aircraft systems as they operate in unison. The first 747-8F also flew a simulated reduced first flight profile with dynamics, flight controls and autoflight checks. The 9h "first flight" test was flown by Mark Feuerstein, chief project pilot for the 747-8F programme and Capt Sheila Beahm, says Boeing. RC501 will continue functional testing before rolling out of the factory then heading to the paintshop and fuel dock for first auxiliary power unit start, followed by a move to the flight line for the intermediate gauntlet. The second phase of gauntlet testing will see the first start of the four General Electric GEnx-2B engines under the wings of the new freighter. After the intermediate gauntlet is complete, the aircraft will move into the final gauntlet systems testing, followed by low and high-speed taxi testing before first flight. RC501 is expected to take its maiden flight early next year, with first delivery to Cargolux in the fourth quarter of 2010. На 9 февруари 1969 г. е осъществен първия полет на най-големия съвременен пътнически самолет "Боинг 747" (Джъмбо Джет). Боинг е водещ американски производител на авиационна, космическа и военна техника. Седалището на компанията е в Чикаго, а най-голямото й подразделение на е в Евърет (Сиатъл).